Until the mid 1980s, carbon was thought to exist only in two physical forms - diamond and graphite. The discovery in 1985 of Buckminsterfullerene with its spherical shape, comprised of hexagonal and pentagonal rings similar to a football, led to further discoveries including, more recently, the long cylindrical tubes of carbon atoms known as carbon nanotubes. 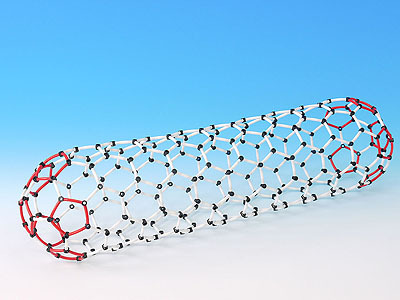 To help teach the structure and properties of these molecules, we are pleased to announce a new single walled carbon nanotube model, made from the Minit building system, as an addition to our range of modelling kits. Using the kit you can make a graphene sheet, three different types of carbon nanotube (chair, zigzag and chiral), a C60 buckyball and related structures with up to 260 carbon atoms.